Two Russian cosmonauts ventured outside the International Space Station today (June 24) to begin a six-hour spacewalk to test and upgrade systems on the orbiting lab's exterior. Russian cosmonaut Fyodor Yurchikhin and his crewmate Alexander Misurkin floated outside to begin their work at 9:32 a.m. EDT (1332 GMT). This is the sixth career spacewalk for Yurchikhin and Misurkin's first. So far, Yurchikhin has logged 31 hours and 52 minutes of spacewalk time. You can watch the spacewalk live on SPACE.com courtesy of NASA TV now. Misurkin is in the blue striped suit and Yurchikhin is in red. "I'm excellent," Misurkin said as Yurchikhin joined him outside of the space station. "I'm ready to press on." Russian cosmonauts Fyodor Yurchikhin and Alexander Misurkin will spend six hours working outside the International Space Station during a spacewalk on June 24, 2013. The cosmonauts are expected to test automatic docking cables in anticipation of a new Russian module scheduled to arrive at the station later this year. 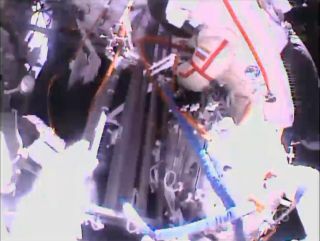 Misurkin and Yurchikhin also plan to install clamps that will hold cables from the station's U.S. side that will power the new module on the Russian portion of the laboratory. They will also install handholds to aid in future spacewalks, retrieve experiments from the outside of the station and "replace a fluid flow control valve panel on the Zarya module," NASA officials said in a statement. This is the first spacewalk since two NASA astronauts performed an unplanned emergency excursion to fix an ammonia leak on the outside of the space station in May. The spacewalk by Misurkin and Yurchikhin will mark the 169th in support of station care and construction. The two cosmonauts are living and working on the space station along with NASA's Karen Nyberg and Chris Cassidy, European Space Agency astronaut Luca Parmitano and Russia's Pavel Vinogradov. The orbiting laboratory is about the size of a five bedroom house with the wingspan of a football field. The $100 billion International Space Station was built by five space agencies representing 15 countries. Construction began in 1998 and has been staffed with rotating crews of astronauts continuously since 2000. Editor's Note: This is an updated version of an earlier story about the spacewalk .